Biographical novels aren't my favourite genre, because while reading them I am always trying to figure out which events probably really happened and which didn't. 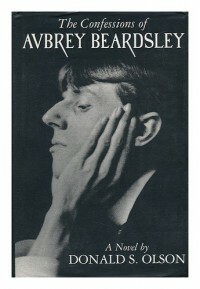 In this case, I didn't know enough about Beardsley to judge, so I ended up reading it as fiction. Unfortunately, as fiction, I didn't find it engaging enough to finish. I made it to almost exactly halfway through, but wasn't interested in finishing it. The only character in he book (so far) is Beardsley himself. While he discusses both his mother and his sister, they are not fleshed out enough to be considered present in this novel. And Beardsley alone thinking about his life just wasn't interesting enough. I think the author might have done well to cut down the book, and concentrated on a few interesting events rather than logging Beadsley's entire life, at least for his childhood if not for the whole book. If you're abandoning biography in favour of writing a novel, you might as well take advantage of it and play with the story a little, leaving out the boring bits. I probably should have stuck with it until after he finishes school and starts becoming famous (and scandalous), but there are just too many other books on my bookshelf waiting for me.